Replacement Radio Batteries by CodeRED Headsets are an affordable and reliable replacement option for Motorola's PMNN4071 radio battery. CodeRED's NiMH (NIckel-Metal Hydride) batteries are the premium aftermarket option when you need a quality, affordable replacement battery that will last a long time. 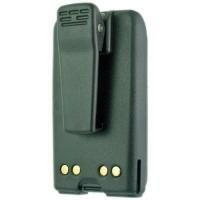 This model offers complete compatibility with Motorola's two-way radios, specifically models Mag One and BPR40. It also comes in black with a built-in belt clip. This battery is covered by CodeRED's one-year warranty (which excludes user damage, abuse, misuse and broken/crushed parts). Please remember to properly recycle your old batteries.